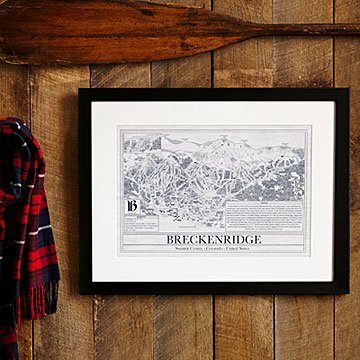 Skiers can take their favorite slopes home with this blueprint-inspired art. Skiers sentimental for their favorite slopes can bring them home in the form of this blueprint-inspired art. Featuring iconic ski resorts such as Park City, Vail, and Breckenridge, each officially licensed print is created with a vintage, distressed finish and features detailed historical and statistical facts about the area. Note: Don't see your favorite resort listed? Keep checking--we'll be adding more soon. Check out our larger version of the Ski Resort Blueprints here! Please click here to see examples of available resorts. Great gift for skier that has a favorite ski area. Great size and competitive price compared to similar things in the market. Great gift for someone who is eagerly waiting for the snow to fall and the slopes to open. Nice picture! Reminds me of good times with friends! Will look great in my friend's home that is right in the slopes of Beaver Creek! I think they will love this picture! This was an awesome gift for my in laws. They live in Colorado and are both avid skiers. My husband and I got them the Breckenridge poster since that is the resort they frequent most often-- it's absolutely beautiful! The attention to detail is incredible as they list each individual run and even some history about the resort itself. My one critique is that it is pretty pricey for what you get. My husband and I ended up buying the large poster unframed and then took it to Hobby Lobby to have it framed. That way we got to choose what frame we wanted and we ended up saving about $50; I'd recommend taking that route to anyone interested in purchasing this poster.